Although not really 'wireless' in the sense that it will not sap the juice while you're walking and holding it, Samsung's recently announced Galaxy S4 smartphone will support wireless charging - with the help of a pad. There's some confusion over whether the Samsung Galaxy S4 supports wireless charging or not. The new flagship Android smartphone does support the feature but not out of the box. It was rumoured that the Galaxy S4 would feature wireless charging but Samsung made no mention of it during the New York launch event last week. The rumour was not unfounded as the Galaxy S3 was supposed to support it but Samsung never actually released the accessories. The catch is that the Galaxy S4 doesn't support wireless charging out of the box like such phones as the Google Nexus 4. However, a wireless charging cover and wireless charging pad will go on sale soon. Qi has announced that its wireless charging standard will be supported by the Galaxy S4, according to a UK retailer, Clove. "In theory you should be able to use other Qi wireless charging accessories rather than Samsung's own ones, but we'll need to confirm that once we've received stock of the device." said the retailer. 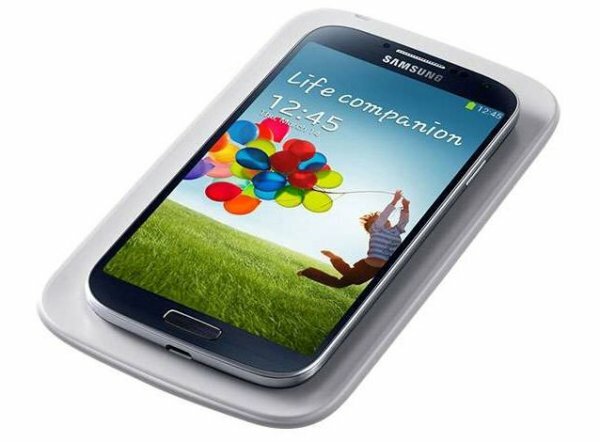 There's no price or release date for the Samsung Galaxy S4 wireless charging cover or wireless charging pad. The Galaxy S4 features a 5in Full HD screen, 8-core processor and a 13Mp camera. The flagship smartphone will be released on 26 April,2013 in the UK. Although pricing is still to be confirmed, one retailer has put a £529 (approx. RM2,495), matching the iPhone 5. A retailer in Kota Kinabalu is confident that the S4 will be released in Malaysia late April. sounds like a cool gadget. i'm so amazed of how fast smartphone technology is improving.